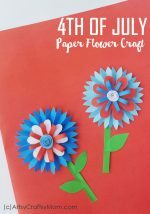 Learn how to make a simple No Sew Felt Flower Craft with Kids, Free Template Included. Use them as pins, or on hats and bags or as a Mother’s day bouquet. I’ve always loved crafting with felt. It’s easy to work with, relatively inexpensive and comes in a rainbow of colors. One of my favorite things to make out of felt is flowers. You can glue them to a hair clip or headband for a quick and easy hair accessory, use as a pencil topper or just give them as is. I know my daughter can get pretty excited over a few hand-made blooms. 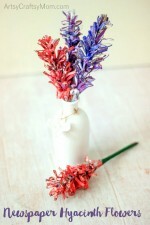 Read on for easy step-by-step instructions on how to make these flowers. You’ll want to make several in different beautiful colors to accessorize your clothes, belt, headband, bracelet or necklace, backpack for back-to-school, for gifts, or for any other occasion. 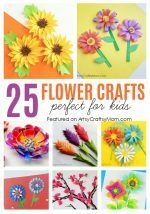 Making your own felt flowers with kids is not only fun, it can be a great money-saver, too. 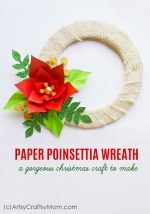 It’s a great craft for fall, spring, or anytime of the year. Step 1: Use the templates to cut out your petal shapes. Step 2: For each flower, we will need to cut out 5 or 6 petals. Step 3: Fold each petal into a cone. Start by gluing the right corner at the center of the petal as shown and then paste the left corner on top of the right one at the center using fabric glue. You will need to press and hold till it is secure. Use a clothespin to hold in place if required. Repeat these steps for each petal. Step 4: Now cut out the bottom part of the flower, the sepal in green felt using the template again. Step 5: Overlap the edges leaving a small hole in the center of a cone shape. Glue in place. Step 6: Pass a small paper or plastic straw through the hole and use glue to stick the top of the straw to the Sepal. Step 7: In a circular fashion, Glue each petal piece around the straw onto the green felt cone. Step 8: Glue all the petals around the straw into the green cone. Step 9: For the center, take a strip of yellow felt. Make some even horizontal fringe cuts along its length taking care not to cut through completely but only 3/4th of the width. Step 10: Roll the felt strip and glue it to keep the roll secured. Then glue it onto the middle of the petals over the straw. Step 11: Now cut some leaves using the templates again and attach them to the flower at the base of the flower. Your felt flowers are complete! 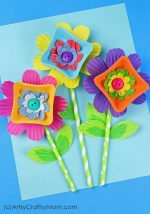 Use the same felt flower template to make a few in different colors, and gather them together in a bouquet!